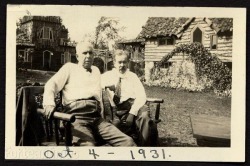 Seated to the left are Theodore Dreiser and Charles Fort. Most everyone knows Dreiser--at least recognizes his name, if never having read Sister Carrie. Comparatively few are familiar with Fort. Which is a shame. There are a resilient few, though, who have taken up Fort's cause. They call themselves Forteans. Charles Fort spent years in the New York Public Library reviewing old newspapers and scientific journals for what he came to called "damned" facts--events reported in good faith yet which have no ready explanation. Rains of frogs. Telepathy. Unaccountable objects in the sky. He collected these in four books. The Forteans took up the torch, focusing on the world's oddities, its unexplained, and seemingly inexplicable, happenings. Some Forteans were important channels through which old occult and mystical ideas were repackaged for the twentieth century. Others shaped the writing of science fiction. Still others confronted the limits of science. My current project is to write a history of the Forteans from the 1930s through the 1950s.